The question comes up often in Nail Yakupov's meetings with NHL scouts and general managers. And even though the 18-year-old Russian is still learning English, he can't help but tense up the second he hears the letters "KHL. The question comes up often in Nail Yakupov's meetings with NHL scouts and general managers. And even though the 18-year-old Russian is still learning English, he can't help but tense up the second he hears the letters "KHL." The likely No. 1 pick when the NHL draft gets underway in Pittsburgh on Friday understands why he's continually asked how committed he is to playing in North America. 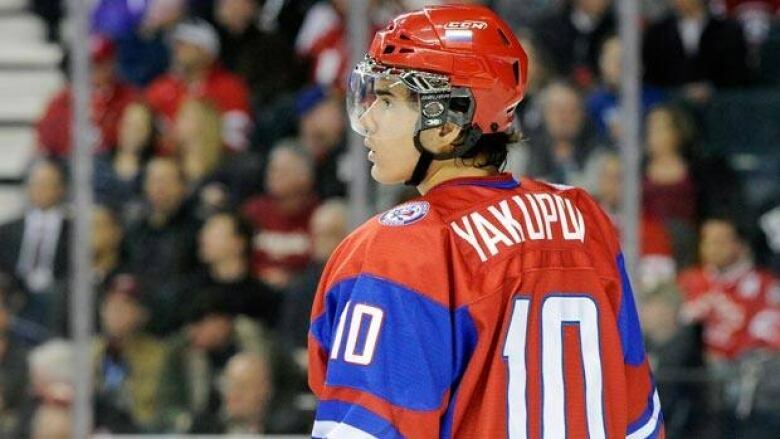 "In the draft they don't want to wonder if some player is going to KHL," Yakupov said. "They just want to (us to) play in NHL and work hard." Yakupov is growing tired of repeating himself, but skepticism is part of the territory now that the once fertile pipeline between Russia and the NHL has started to dry up. The big-time paydays — not to mention shorter schedule — of the Kontinental Hockey League has many Russian stars opting to stay home rather than lace up their skates halfway around the world. All Yakupov can do is shrug his shoulders and stress — again and again — that he prefers the Stanley Cup to Gagarin Cup, the one awarded to KHL champions. "I say just what I feel inside and I say I want to play in the NHL," Yakupov said. "It's not my deal what teams think, if they don't trust me or not. I want to play in NHL." So do two other players with Russian ties counted among the top forwards available, Alex Galchenyuk and Mikhail Grigorenko. All three pose high-risk, high-reward scenarios. If clubs get skittish, defenceman Ryan Murray from Regina, Saskatchewan could rise all the way to the top spot. The Edmonton Oilers have the No. 1 pick for the third straight year and while general manager Steve Tambellini says he's "comfortable" holding onto it, he's not ruling out shipping the selection elsewhere if another team provides a package that would give the struggling franchise an immediate lift. While the 5-foot-11, 185-pound Yakupov insists he's ready to play now after lighting up the Ontario Hockey League the last two years, some teams remain concerned if Yakupov and other high-profile players with Russian ties will bother playing in the NHL at all. "There's so much money in the KHL right now, it's very easy for those guys to say, 'I'll take my $5 million and go play in Russia for two or three years and then I'll come back,"' Buffalo Sabres director of amateur scouting Kevin Devin said. "Well, it never becomes that easy." The prospect of entering a bidding war with the KHL has led to a steep drop in the number of Russian players selected in recent drafts. There were 18 Russians taken in the 2004 draft, including top overall pick Alexander Ovechkin and No. 2 pick Evgeni Malkin, who won the Hart Trophy for NHL MVP on Thursday night. There have been 16 Russians selected in the last two drafts combined. The Boston Bruins were fresh off a Stanley Cup win last summer when they grabbed winger Alexander Khokhlachev in the second round. Even the prospect of joining an elite team couldn't stop Khokhlachev from bolting for the KHL. Sometimes, even when they do agree to play in the western hemisphere, there are no guarantees. The Nashville Predators took a flier on Alexander Radulov in the 2004 draft and eventually signed him to a contract. Radulov played two seasons with the Predators before signing a lucrative deal with the KHL's Salavat Yulaev Ufa. The mercurial Radulov eventually returned to Nashville this spring, where he played sometimes uninspired hockey. The Predators decided not to extend Radulov's contract. Though he could be one of the most high-profile players on a somewhat underwhelming free-agent market, Radulov appears set to head back to the KHL. To help entice the best players to stick around, the income tax rates for top Russian players is decidedly lower — 13 per cent — than what they would face in the U.S. or Canada. Throw in the NHL salary cap and the rookie wage scale — which does not exist in the KHL — and it's no wonder Devine called selecting a Russian "risky." Galchenyuk isn't offended by the notion, but then again every situation is unique. Though his surname is packed with consonants and his parents are both Russian, the 18-year-old Galchenyuk was born in Milwaukee. Technically, he's American even though he spent the majority of his childhood hopscotching across the globe depending on where the playing career of his father Alex Sr. took the family. "I don't even have my Russian passport anymore," Galchenyuk said with a laugh. "I'm an American citizen. It's not a big (trend) for an American to go play in Russia, so they believe me when I say I want to play in the NHL." And while the skepticism remains, the potential of Galchenyuk, Yakupov and Grigorenko guarantees teams with picks in the top 10 will take a chance. It certainly worked out for Washington and Pittsburgh in 2004. Ovechkin basically saved hockey in the nation's capital while Malkin became one of the linchpins for a franchise that is a perennial Cup contender. Malkin sheepishly accepted the Hart, Ross (scoring title) and the Ted Lindsay Awards in Las Vegas on Wednesday, graciously thanking former teammate and fellow Russian Sergei Gonchar for helping him adjust to life in the U.S. as an immature 18-year-old. It's a lot for Yakupov to live up to, and he insists he's ready to tamp down the anxiety level for whichever team's sweater he dons on Friday night. All due respect to the quality of play in the KHL and the lavish contracts that await the top players, there's only one place Yakupov wants to play next year, and it's not in Moscow. "The NHL is the best league in the world," Yakupov said.